1. Preheat oven to 190 degrees C. Fill a large bowl with water. Place potatoes in water bowl. 2. For potatoes, slice a thin slice, lengthwise from the bottom of each potato, so they can stand without rolling on the cutting board. Slice potato crosswise into 1/2 cm thick slices, slice carefully till halfway of the potato do not slice all the way through. 3. Return sliced potato to water bowl. Repeat with remaining potatoes. Line a 38x25x2.5 cm baking pan with foil; grease foil. 4. Drain potatoes well and pat dry. Arrange potatoes in the prepared baking pan. Brush evenly with 2 tablespoons of the melted butter and sprinkle with 1/2 teaspoon of the salt. 5. Cover with foil. Bake for 45 minutes. Uncover. Bake for 10 to 15 minutes more or until tender. Remove from oven. Turn oven to broil. 6. Preheat broiler. In a small bowl stir together bread crumbs, cheese, chives, thyme, and the remaining 1/2 teaspoon salt. 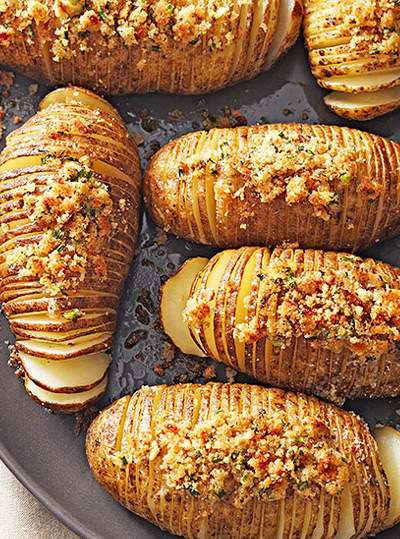 Sprinkle potatoes evenly with crumb mixture. Slowly and carefully spoon on remaining 3 tablespoons melted butter, being sure to cover all of the crumb mixture. 7. Broil potatoes 10 - 12 cm from the heat for 2 to 3 minutes or until topping is golden. Serve immediately.